#SSC #ECHSLExam 2017 Onile Registration and #OnlineApplicationForm Extended to 27th December 2017. SSC Postal/Sorting assistants, LDCs, DEOs, Clerks Recruitment 2017/SSC CHSL Exam: SSC jobs, SSC various posts recruitment, Staff Selection Committee Recruitment, CHSL exam 2017, Last date for apply, Online application form, Online Exam date, How to Apply details @ http://ssc.nic.in/ or http://ssconline.nic.in/. SSC CHSL Exam-Postal Assistants/ Sorting Assistants, LDC, DEOs, Clerks Recruitment 2016 Notification: Staff Selection Commission (SSC) has given notification for the recruitment of Postal Assistant/ Sorting Assistant, Data Entry Operator & Lower Divisional Clerk vacancies by conducting CHSL Combined Higher Secondary Level (10 + 2) Examination 2017. SSC CHSL recruitment exam 2017 Notification, apply now: The Staff Selection Commission (SSC) has issued a notification for the Combined Higher Secondary Level (10+2) Examination 2017 on its official website to fill approximately 3,259 posts. There are 898 vacancies for lower divisional clerk/junior secretariat assistant, 2,359 for postal assistant/sorting assistant and two vacancies for data entry operator. The computer-based objective type Tier-I examination will be held tentatively from March 4 to March 26, 2018. The Tier II exam (descriptive paper) will be held tentatively on July 8, 2018. The application process will continue until December 18. Candidates should check the eligibility and other details carefully before applying for a certain post. 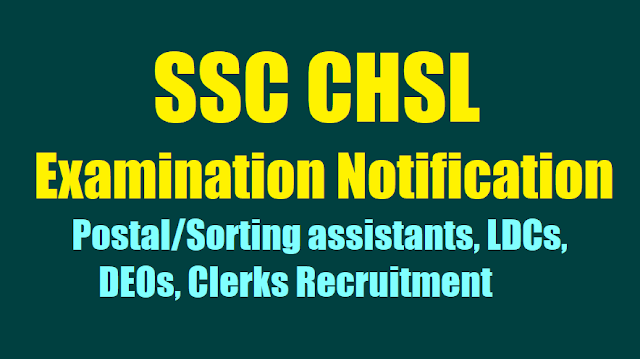 SSC CHSL Exam Notification: The Staff Selection Commission will hold an examination for Recruitment of Postal Assistants/Sorting Assistants, Data Entry Operators, Lower Divisional Clerks and Court Clerk. Staff Selection Commission (SSC) has released official notification for Combined Higher Secondary Level (10+2) Examination, 2017. The exam, which is held every year to select candidates to the posts of Lower Divisional Clerk/ Junior Secretariat Assistant, Postal Assistant/ Sorting Assistant and Data Entry Operator will be held in March 2018. The tier 2 exam will be held in July 2018. Online registration for SSC CHSL 2017 will be open till 18 December 2017. Details of the exam can be found at the official website of the Commission at ssc.nic.in. Candidates in the age group of 18-27 years with 10+2 educational qualification are eligible to apply for the SSC CHSL 2017. 'For Data Entry Operator in the Office of Comptroller and Auditor General of India (C&AG): 12th Standard pass in Science stream with Mathematics as a subject from a recognized Board or equivalent. Candidates must have passed class 12 from a recognised university or institute. Selection Process: Based on Written Test, Typing Test/ Skill Test, Typewriting test. Exam scheme: Paper 1 will be of 200 marks and 100 questions will have to be answered in one hour. The candidates will get 25 questions of 50 marks each on general intelligence, general awareness, English language (basic knowledge) and quantitative aptitude (basic arithmetic skill). There is negative marking of 0.50 for each wrong answer. Candidates who clear Paper-I will be called for Tier II. Tier-II will be a descriptive paper of 100 Marks to be solved in an hour in pen and paper mode. This exam will evaluate the writing skills of the candidates. It will comprise writing an essay of 200-250 words and letter or application of approximately 150-200 words. The minimum qualifying marks in Tier-II would be 33%. The performance of a candidate in the Tier II exam will be included in preparing their merit. The paper will have to be written either in Hindi or English. Tier-III exam: Tier-III would be the skill or typing test of qualifying nature. The final merit of the successful candidates will be determined on the basis of the total score obtained by them in Tier-I and Tier-II. The exam will consist of a computer based exam (tier I), descriptive paper (tier II) and typing test/skill test (tier III). a. Computer based exam Tier 1: The exam will have 100 questions based on English language, general intelligence, quantitative aptitude (basic arithmetic skill) and general awareness. It will be held for a duration of 60 minutes while VH/OH (afflicted by cerebral palsy and OH with deformity in writing hand will be given 80 minutes to write the test. Note: Candidates must note that the negative marking is applicable, 0.50 marks will be deducted for each wrong answer. This exam will be in pen and paper mode and the duration of the exam would be for one hour. It would comprise writing an essay of 200-250 words and letter application of approximately 150-200 words. The paper will have to be written either in Hindi or in English. c. Typing and skill test Tier III: For detailed paper pattern, candidates are advised to see the official notification. The Staff Selection Commission (SSC) has published the official notification of the Combined Higher Secondary Higher Level (10+2) Examination 2017. The registration for the same has started from today, November 18 and will continue till December 18. Online registration has begun for SSC CHSL 2017. Applicants, who have qualified 10+2 and are in the age group of 18-27 years can apply for it. Aspirants should have a thorough knowledge on the exam pattern. SSC CHSL tier 1 exam will be held in March and the tier 2 exam (descriptive paper) will be held in July 2018. 'Tentative vacancies for the posts of LDC/ JSA, Postal Assistant/ Sorting Assistant and DEO are 898, 2359, 2 and Data Entry Operator Grade "A"- Nil, respectively,' says the Commission about vacancy details. Online application can be submitted at ssconline.nic.in along with fees of Rs. 100, which can be paid through SBI Challan/ SBI Net Banking or by using Visa/ Mastercard/ Maestro Credit/ Debit card. SSC had declared Tier 1 result for CGL 2017 in October. A total of 150404 candidates have qualified the exam and are eligible for the next selection phase which is scheduled to be held in December 2017. 'The Combined Graduate Level (Tier-II & Tier-III) Examination, 2017 is tentatively scheduled to be held from 21.12.2017 to 24.12.2017,' reads the official notification.. The registrations for Staff Selection Commission, SSC's Combined Higher Secondary Level Examination 2017 would close on December 20. As per the latest notice released on the official website ssc.nic.in, the last date to apply online on for the SSC CHSL 2017 examination has been extended till 5:00 pm on December 20, 2017. For the candidates who wish to make challan payments, the last date to submit applications would be December 22, 2017, provided the challan is generated before 5:00 pm on December 20. Step 5: All candidates are requested to go through the eligibility criteria carefully before applying. Step 6: The fees can also be paid online. The facility to fill the online application form for SSC CHSL 2017 would close now on December 20, 2017, at 5:00 pm on the official website. Women candidates of all categories and candidates belonging to scheduled caste, scheduled tribe, persons with disability and ex-servicemen eligible for reservation are exempted from payment of fee. SSC CHSL 2017 Registration Extended to 27th December 2017: SSC CHSL 2017 registration process has been further extended to 27th December 2017, 5PM by the Staff Service Commission (SSC) on its official website – ssc.nic.in. The Combined Higher Secondary Level (10+2) Examination 2017 Tier I is scheduled to be conducted from 4th to 26th March 2018 across the country. Candidates were asked to apply before 18th December 2017, which was extended to 20th December 2017. The SSC Combined Higher Secondary Level (10+2) Examination 2017 is aimed to fill 3259 vacancies for the posts of LDC/JSA (898), Postal Assistant/Sorting Assistant (2359) and DEO (2).